Pythons are non-venomous, very large, slow-moving, nocturnal snakes that kill their prey by strangulating. Burmese Python Python bivittatus is found in the foothills of Himalayas and North-east India. It is one of the largest snakes in the world with females being bigger in size than the males. 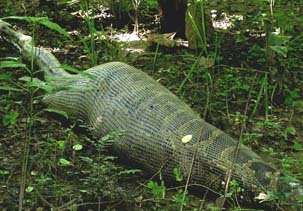 A full-grown adult female can be as big as 19-20 feet long. This snake preys upon birds, mammals, reptiles and amphibians, mostly during the night. There are pits located on its snout and upper lip that can sense the body heat of its prey in the dark and help the snake locate its prey. In the jungles of Corbett Landscape, overlooking NAMAH, a Burmese Python killed a full grown female Spotted Deer Axis axis and swallowed it whole. As the snakes are cold-blooded creatures, such a prey may take more than a month to digest and the snake may survive for up to a year without another meal. Burmese Pythons are quite tame and tolerate humans very well. Sometimes they occur close to human habitations and are killed by villages who cannot differentiate between venomous and non-venomous species. We, at NAMAH, encourage local communities of the area to report such occurrence so that these snakes can be rescued and released back into safer parts of the jungle, away from human habitation. Local children are encouraged to participate in snake rescue and release, to sensitize them about the need to protect such wonderful creations of nature. 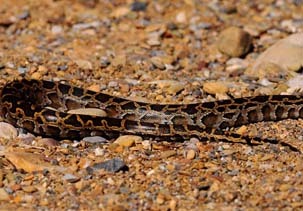 "A young Burmese Python photographed on a Game-drive in the Corbett Landscape jungles overlooking NAMAH." 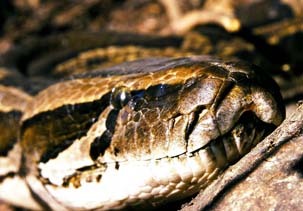 "Burmese Python showing heat-sensing pits in its snout and upper lip. The snake can locate its prey by sensing its body heat in the dark."